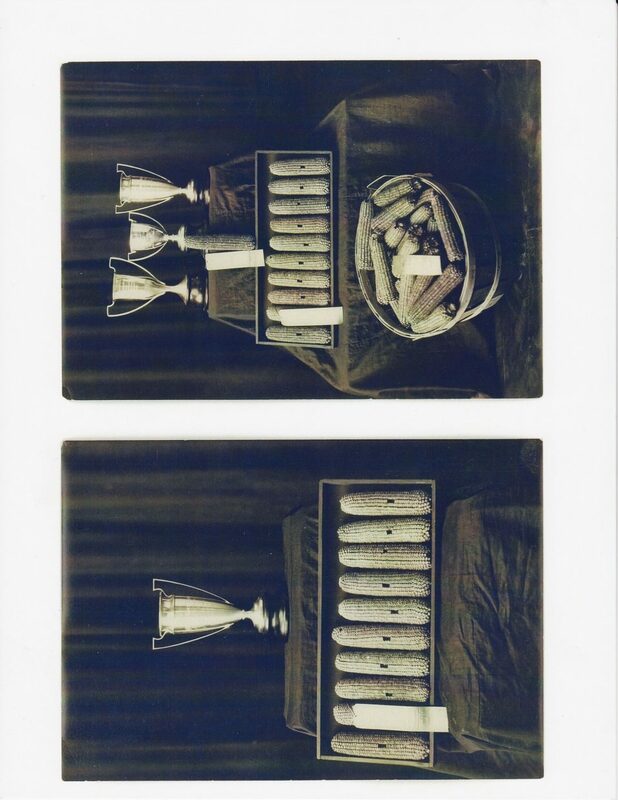 These are photos of some of the trophies that the corn club won. 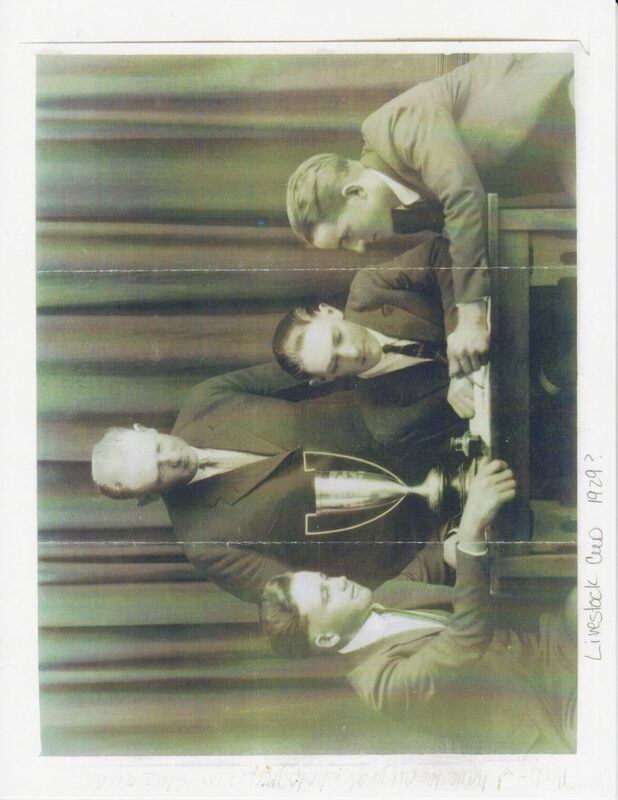 This photo was possibly taken in 1929. Standing is Ralph "Prof" Wilson with three of his students. The history of agricultural education and the Future Farmers of America (FFA) speaks well of a rich heritage and can help tell the story of agricultural production and agribusiness nationwide. A story we need to share with increasing urgency. We learned of the land grant legislation and the establishment of the Land Grant Colleges nationwide. Soon after, Extension education practices and efforts were used to make use of research information and work being done at the agricultural colleges. Formal extension agencies were established in about 1914. 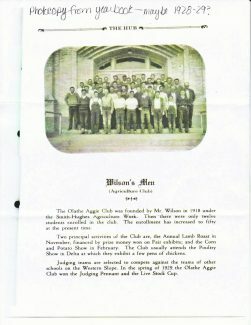 The Smith Hughs Education Act established agriculture science and mechanics programs in high schools across America in 1920. Many people have benefitted and made significant contributions to the people in agriculture as a result of these two pieces of federal legislation. Indeed we frequently read articles depicting or telling of the current ways American farmers and ranchers have changed our lives. Yes, the American public needs to know and appreciate more about where and how their food is produced. There are a large number of consumers and people far removed from the everyday activities of farming and ranching today. American heritage stories and histories can play a major role in developing and teaching an understanding of the importance of agriculture and related industries in our daily lives. To do so we recognize the worthy achievements of men and women by awards, honors and through various promotions to societies and halls of fame. This article is about just such a person, even though his career ended some 50 years ago, his achievements are significant and noteworthy. Ralph Wilson of Olathe, Colo., became known as "Prof Wilson." 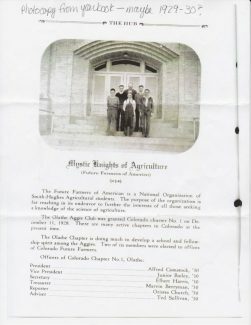 In cooperation with the then Colorado A&M Extension workers he became well known and respected from Grand Junction to Montrose, Colo., and beyond. His efforts and those of his students made high impacts upon agriculture using improved and best practices in farming and ranching. Prof was a 1915 graduate of Purdue University in Muncie, Ind. He arrived in Olathe to become a teacher at the local high school in 1923. He promptly became all things to Olathe High School, as a teacher of science, biology, vocational agriculture and an athletics coach, teaching everything except home economics. Corn clubs were popular and his students excelled in production, preparing and showing farm produce. Their judging skills became very strong netting them many awards as time progressed. Through these efforts, improved varieties of corn, beans and other crops were developed by Prof and others, which were adapted to western Colorado. Along the way fruit crops were being introduced namely; cherries, peaches, grapes and especially apples. These skills and practices too were incorporated into the studies for students and the vocational agriculture curriculum. Prof introduced Duroc hogs and later Berkshire hogs into western Colorado. He became a cattle producer's go-to man, He developed a strong relationship between his boys and the sheep producers of western Colorado. Field trips to carry out best animal practices, selection and handling were to be experienced especially in the spring of each year. Prof's motto was "We are taking boys and making men of them in production agriculture." He established the first vocational agriculture shop in Colorado in an old wooden building, which was still available for use well into the 1960s. 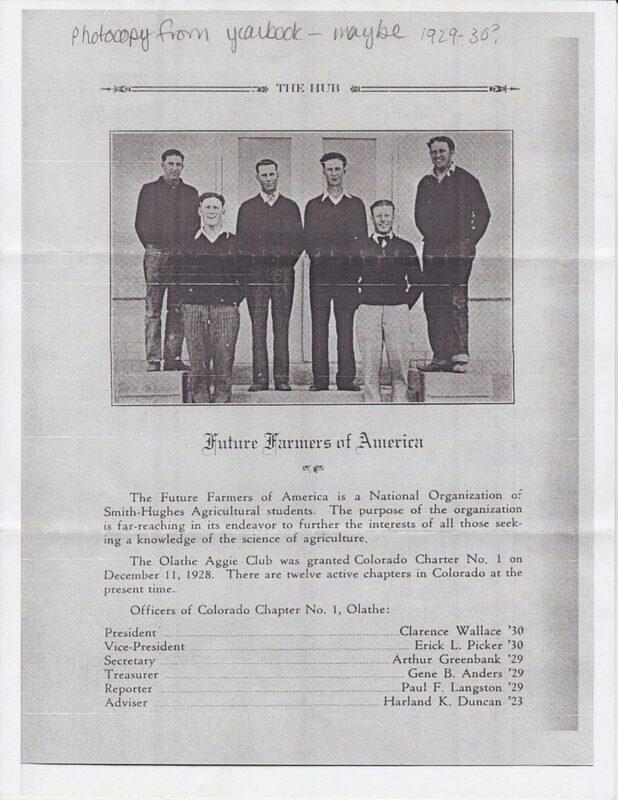 His corn club became the very first Future Farmers of America chapter, charter No. 1, in Colorado in 1929. Prof became the first Colorado FFA state prsident and he and his chapter members initiated charter chapters in Montrose, Delta and Center, Colo., in 1928-1929. Other FFA chapters soon became active throughout all Colorado. There is indeed a long history of agriculture, science and mechanics in our public schools as a result of the efforts of many dedicated agriculturally trained teachers. The Olathe FFA chapter has been active continuously since its inception in 1929. 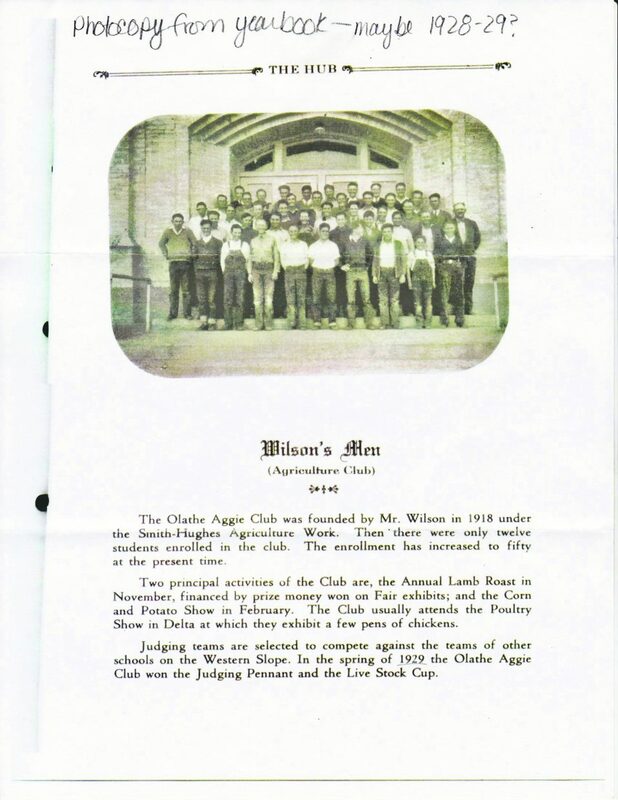 Its members have achieved considerable success throughout the years. Many of its members have earned local, state and national degrees through their efforts in the program and the FFA. Several farmer members have served as state FFA officers over the years. The current tecacher/advisor, Jaime Goza, is an experienced teacher serving in his first year as FFA advisor at Olathe High School. Sixty-six students are currently enrolled in his classes. An accurate historical count of state officers, state and national degree recipients are not available. However, records do show of five American degree recipients, 20 state degree recipients, eleven state officers and six state championship judging teams from the Olathe chapter. The 2015 Olathe meats judging team of four persons placed 13th among all teams at the national competition that year. The current livestock judging team placed 10th at the 2017 National Western Stock Show. Their floriculture team has placed very highly this year. Statewide, there are 112 FFA chapters in Colorado, 21 are of which are middle school programs. The number of Young Farmer Education programs is 12. National FFA week will occur Feb. 18-25. Many of the schools in Colorado and the nation will conduct special programs and achievements at their schools. Each of these will help tell the story of agriculture in America.